Activists say the latest Syrian government shelling has killed at least 16 people in a rebel-held area of the northern city of Aleppo. Rami Abdurrahman of the Britain-based Syrian Observatory for Human Rights said on Friday that the shells struck at the city's Qadi Askar area. Abdurrahman says the shelling took place on Thursday and that it took hours to verify the number of the victims. 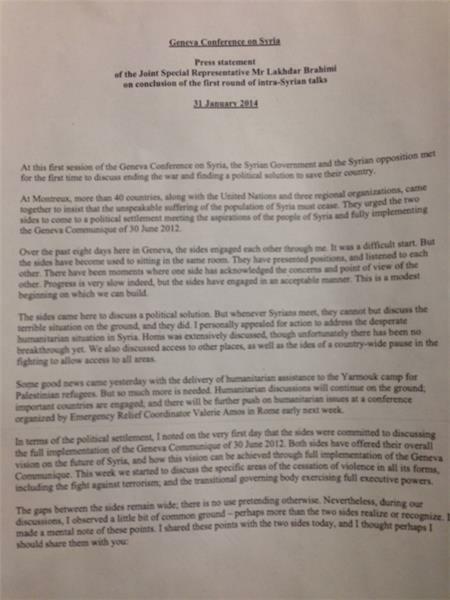 The Aleppo Media Center, another activist group, also provided a similar report. Syrian forces have been shelling rebel-held parts of Aleppo for weeks, on many occasions unleashing barrels packed with explosives from military helicopters. The shelling has taken place as Syrian ground forces inch closer to eastern parts of Aleppo, which rebels seized in July 2012. Brahimi has said the opposition has agreed to return to talks on February 10, but the government delegation says it needs to consult with Damascus before deciding. Peace talks between Syria's regime and opposition have made slim progress, but have raised hopes for a solution to the country's civil war, UN mediator Lakhdar Brahimi has said. "This is a very modest beginning, but it is a beginning on which we can build," Brahimi told reporters after a week of closed-door negotiations wrapped up in Geneva on Friday. "Those who have guns have to think of their people", Brahimi has said. Brahimi: "They [the Syrian government delegation] said they would come but they needed to check with their capital". The first page of Brahimi's statement. 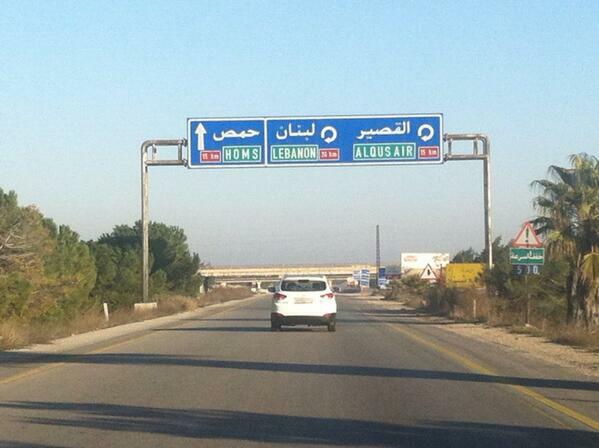 Lebanese troops have exchanged fire with unidentified Syrian gunmen near the country's border with Syria, a security source said, after two-cross border incidents in the area. There were no casualties in the gun battle on Friday, which came after at least one person in Lebanon was killed by shelling from Syria and a deadly rebel attack against Syrian forces launched from Lebanon. "Lebanese army forces exchanged fire with gunmen near an army checkpoint in an area near the town of Wadi Khaled," the security source said. He added that the gunmen, believed to be Syrian, had escaped afterwards. The fighting came after a barrage of at least 14 shells fired from Syria hit the Akkar border area of Lebanon, killing a Syrian man and wounding three Lebanese citizens, the source said. The Syrian Observatory for Human Rights meanwhile said rebels had launched an attack from Lebanese territory against two villages near the Syrian town of Talkalakh. The Britain-based group said five regime forces, including soldiers, border guards and pro-government militiamen, were killed. In northern Syria, meanwhile said at least 16 people were killed in three regime aerial attacks on parts of Aleppo city, the Observatory said. It said one of the attacks involved the use of explosive-packed barrel bombs dropped from helicopters, which the regime also used in central Hama, Damascus province and northwestern Idlib province on Friday. Meanwhile, rebels took control of the village of Swisah in Quneitra, several kilometres from the ceasefire line that divides the Syrian-controlled Golan Heights from the Israeli-occupied sector. At least 46 civilians were killed Saturday, 33 in one neighbourhood, when Syrian regime helicopters dropped explosive-packed barrels on rebel-held areas of the northern city of Aleppo, a monitor said. The death toll from air raids and barrel bomb attacks by Syrian government forces on the city of Aleppo has risen to 85, a monitoring group said. The Syrian Observatory for Human Rights said on Sunday that regime helicopters hit rebel-held areas of Aleppo with barrels packed with explosives. The so-called barrel bombs are a controversial weapon, condemned by rights groups as indiscriminate. "At least 85 people were killed, including 65 civilians, 10 of whom were children," on Saturday, the Observatory said. Attacks targeted several areas of the city, with 34 killed in the southeastern Tariq al-Bab area alone, among them six children. Another 22 civilians, including another six children, were killed in the Salhine, Ansari and Marjeh districts, with nine others killed in other parts of the city. Syrian government helicopters and warplanes have unleashed a wave of airstrikes on more than a dozen opposition-held neighborhoods in the northern city of Aleppo . The government dropped missiles and crude barrel bombs in a ferocious attack that killed at least 36 people on Sunday, including 17 children, activists said. Syrian military aircraft targeted 15 opposition-controlled neighborhoods, said an activist who goes by the name of Abu al-Hassan Marea. The Britain-based Syrian Observatory for Human Rights monitoring group said the Tariq al-Bab district on the eastern edge of the city was the hardest-hit, with at least eight barrel bombs raining down on it Sunday. 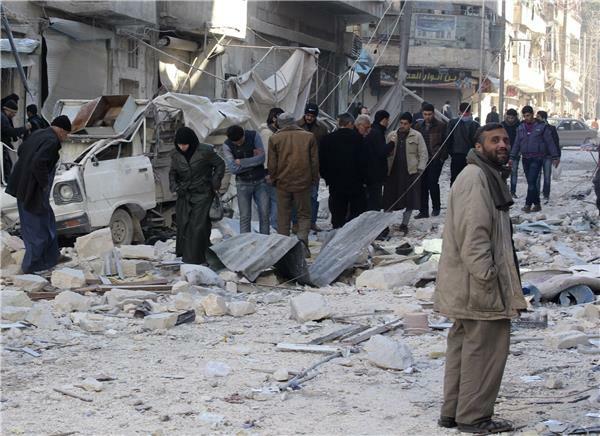 Marea said one of the air raids in the neighborhood struck a vegetable market and another landed near a mosque. 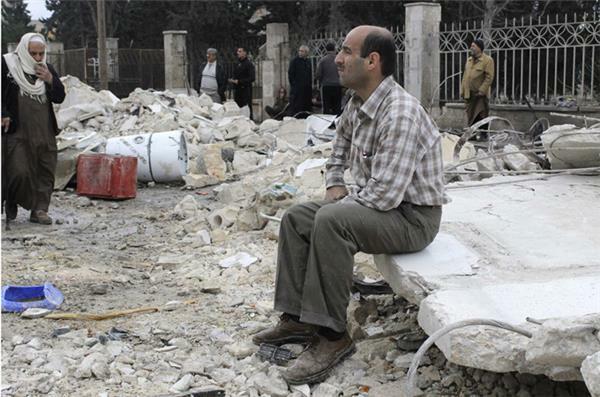 The Aleppo Media Center activist group said the strike near the Abdullah bin Masoud Mosque killed more than 10 people. The Observatory put the day's death toll in the air raids at 36, including 17 children. Marea said that more than 50 people were killed in the airstrikes, although he did not have an exact count. This footage shows the scene where a barrel bomb was dropped in Aleppo's Hanano district, shortly after the attack. This footage shows the aftermath of the air strike in Aleppo's Hanano district. The son of prominent Syrian activist and opposition National Coalition member Fayez Sara has died after being tortured in a prison in Damascus, his father and the Coalition said Monday. The Coalition's press office announced "the death of Wissam Fayez Sara in prison under torture" in a statement, and his father also confirmed the news on Facebook. "After all the blows we have been dealt, and all the blows that our people have been dealt killing, arrests, displacement and destruction, they told us today that Wissam was tortured to death in the military security branch in Damascus, two months after he was arrested in Damascus," Sara wrote on his Facebook page. 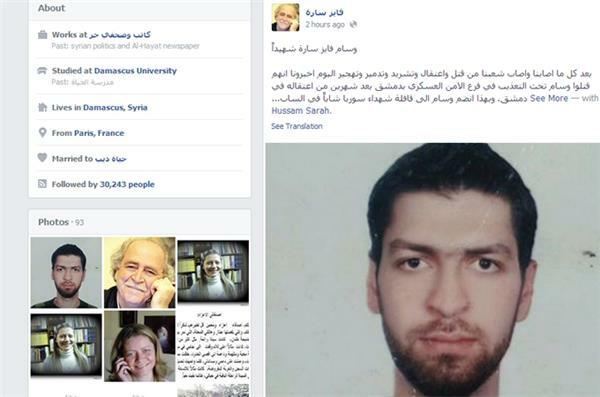 He said his son, a 27-year-old father of two, had joined "the martyrs of Syria." "Wissam was one of the first among the youth in the revolution to go out, protest and work in activism against the dictatorship," he wrote. He said his son was a "peaceful fighter," and had been arrested for the first time in the spring of 2012 along with his elder brother Bassem, before being released. Wissam was arrested again in December 2013 and "then tortured to death," he wrote. Fayez Sara has been a member of the Coalition's political committee since August 2013. He has been active in opposition, leftist and labour union circles in Syria for decades, and was among the signatories of the Damascus Declaration calling for reform. He has been arrested multiple times and spent two years in prison in the late 1970s for his involvement with leftist groups. He was also held for a month at the beginning of the Syrian uprising in March 2011, and now lives in Turkey. The Syrian government extended its intense aerial campaign against rebel-held areas of the northern city of Aleppo on Monday, conducting a series of airstrikes that killed at least 18 people, including five children, activists said. President Bashar Assad's air force has pounded opposition areas of the divided city since mid-December, reducing apartment blocks to rubble and overwhelming already strapped hospitals and medical clinics with the wounded. On Sunday, government aircraft also targeted areas of east Aleppo under rebel control, killing nearly 40 people. Monday's air raids hit the districts of Hanano, Qadi Askar and Mouwasalat, the Britain-based Syrian Observatory for Human Rights said. 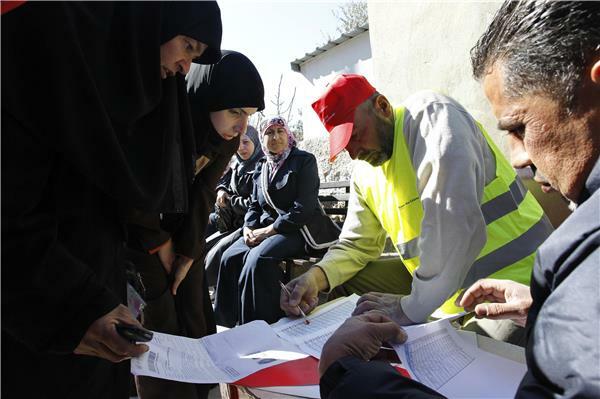 The group, which monitors the conflict through a network of activists on the ground, said helicopters dropped crude bombs, barrels packed with explosives, fuel and scraps of metal, on the neighbourhoods, causing immense damage. Amateur videos posted online provided a window on the carnage. In one clip from Hanano, residents frantically dig through the shattered blocks of concrete and twisted metal strewn across the street in search of survivors. A man stumbles over the rubble as he carries a wounded boy wrapped in a blanket, his arm and face covered in blood. Further down the street, the facades of buildings have been torn off by the bomb. In a second video, two men place the shredded remains of a body onto a carpet. Another body covered in a blanket lies in a pool of blood on dusty pavement. Nearby, two women rock back and forth as they wail over a third body. The Syrian government has not relented in its bombardment of rebel-held areas of Aleppo since launching what appeared to be a concerted aerial campaign there late last year. Over a two-week stretch in December alone, activists say airstrikes killed more than 500 people. Syria's opposition has pointed to the air raids as evidence that Assad has little interest in peace despite sending a delegation to Switzerland last week for UN-sponsored negotiations aimed at ending the nearly three-year uprising. The first round of talks failed to secure any meaningful agreement other than to meet again later this month for more talks. Since it began with largely peaceful protests in March 2011, the Syrian conflict has killed more than 130,000 people, forced almost a third of the country's prewar population of 23 million from their homes, and inflamed sectarian tensions that have jolted the entire Middle East. Despite the immense suffering and terrific toll of the war, the violence shows little sign of abating. 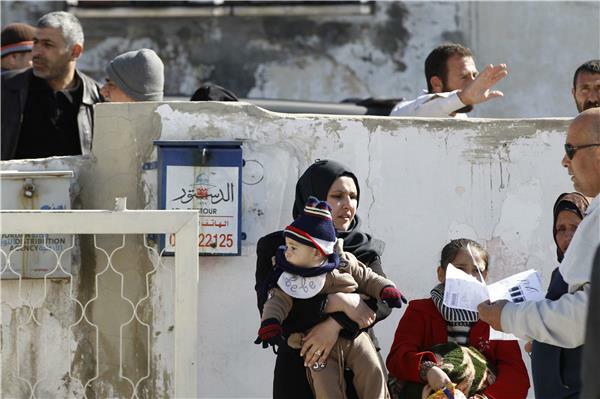 On Monday, the Observatory said that January was the deadliest month of the conflict. The group said it recorded 5,794 deaths that it had evidence of last month, plus around another 1,000 that it knew of but for which it did not have names, photographs or video to provide final confirmation. Russian officials say that the Syrian government will attend the next round of peace talks in Geneva, Feb. 10. Read the full article here. The relief organisations in Yarmouk camp in Damascus have closed the schools in the camp because of the imposed siege on the region, lack of school supplies and, spread of diseases among children in the absence of the availability of medicines and govt bombing that targets schools as well. This video uploaded to YouTube, is said to show the aftermath of a barrel bomb attack launched by President Assad's forces in the Hanano district of Aleppo . This video uploaded to YouTube, is said to show the impact of two barrel bomb attacks on Daraya. Russia's U.N. Ambassador Vitaly Churki told reporters on Wednesday that now is not the time for a UN resolution on aid to Syria and that "hard, pragmatic and purposeful work" is necessary before considering a resolution on aid access. The governor of Homs has said a deal was reached with the United Nations on Thursday to evacuate civilians from the besieged old city, where forces loyal to Syrian President Bashar al-Assad are surrounding rebel-held areas, Syrian state media reported. Russia's Foreign Ministry said earlier on Thursday that an agreement to allow in humanitarian aid was also under discussion. The head of the international chemical weapons mission in Syria told the UN Security Council that the deadline looming for the elimination of Syria's toxic arsenal with accelerated cooperation is vital, a diplomat said. The remarks came from Sigrid Kaag, head of the joint mission of the United Nations and the Organization for the Prohibition of Chemical Weapons (OPCW) that is overseeing the destruction of Syria's chemical arsenal. "With deadline on the horizon, it is essential that Syria accelerates" shipments of toxic chemicals out of the country, Kaag told a closed-door briefing of the 15-nation Security Council, a diplomat attending told Reuters on condition of anonymity. "Time for action is now." Talal Barazi, the Governor of Homs confirms to Al Jazeera that an agreement to evacuate some civilians from the besieged city of Homs has been agreed as UN teams arrive at the besieged city. Barazi told Al Jazeera's Nisreen El-Shamayleh that a ceasefire will start on Friday at 04:00 GMT and evacuations will begin 07:00 GMT. 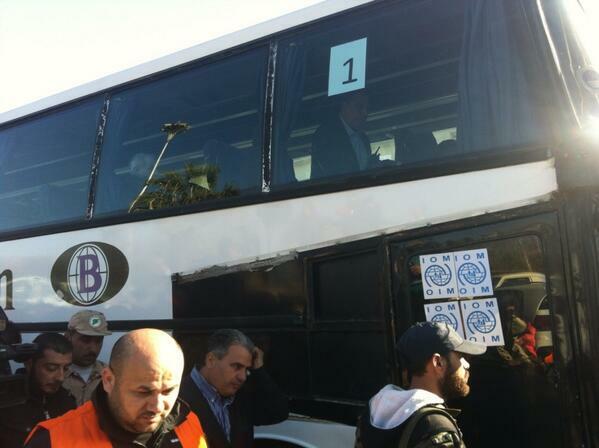 Around 300 people from several neighborhoods of the Old City will be allowed to leave. The include women, children up to the age of 15 and men over the age of 55. This video uploaded to YouTube, is said to show the offensive led by Ahrar al-Sham & Jabhat al-Nusra on Aleppo's central prison. Reports are circulating on social media that Chechen Saifullah al-Shishani was killed along other foreign fighters during an assault on Aleppo central prison. Photos purporting to show his death are circulating online. Social media has also been reporting that a British Pakistani carried out the initial suicide attack that led to the freeing of prisoners. Al Jazeera cannot independently verify these claims. Remarks by Ambassador Samantha Power, U.S. Permanent Rep. to the United Nations, on Syria. #Syria 's deputy foreign minister says the government will take place in a second round of Geneva peace talks. [Reuters]. 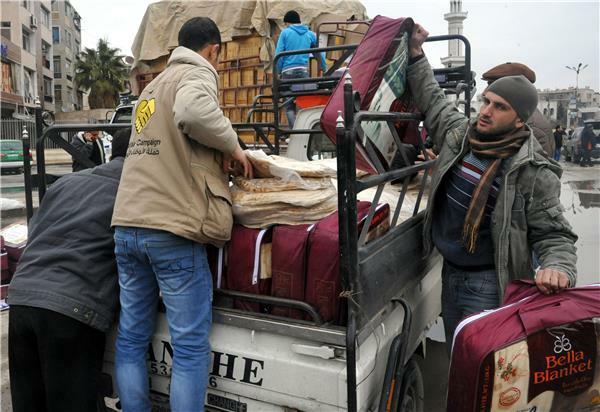 Reuters reports that the Syrian Arab Red Crescent has ambulances at arrival points for evacuees and that it has already transported one patient for treatment. "That person went through ahead apparently of 200 others who are coming," a spokesman said, adding that the Syrian Red Crescent volunteers had not entered the town. 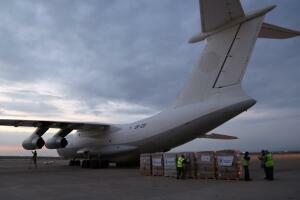 The ICRC is not involved in the operation, he added. 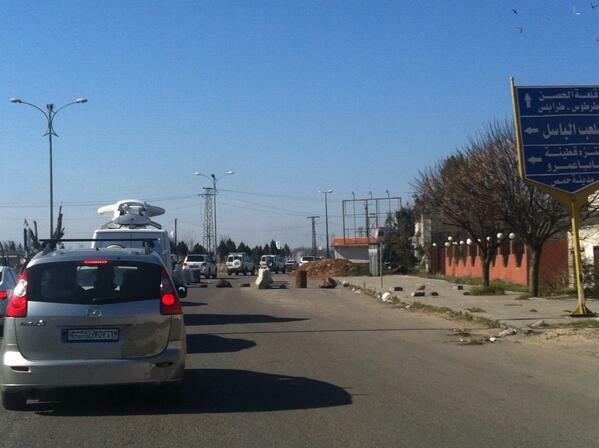 Syrian state TV has confirmed the arrival of the first batch of evacuees. 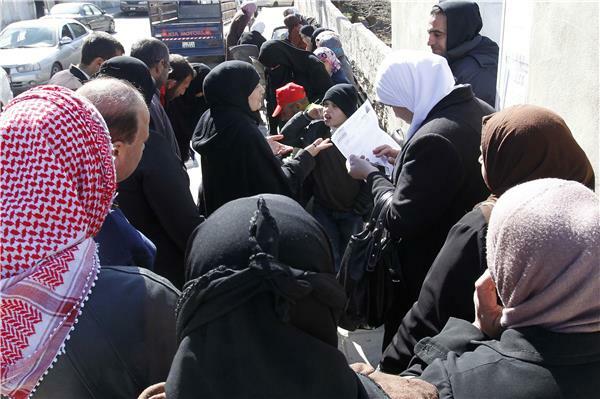 The Homs governor has said on Syrian State television that they have now received the second batch of 18 civilians, which includes six women. Al Jazeera's Mysa Khalaf, reporting from neighbouring Lebanon, says the Syrian Observatory for Human Rights, a UK-based monitoring group that opposes Assad, says a government sniper fired twice on the first batch of evacuees, injuring a man trying to get on the bus. She reports, however, that al-Mayadeen television, which is close to the government, says that the man was wounded by rebels inside Old Homs city. 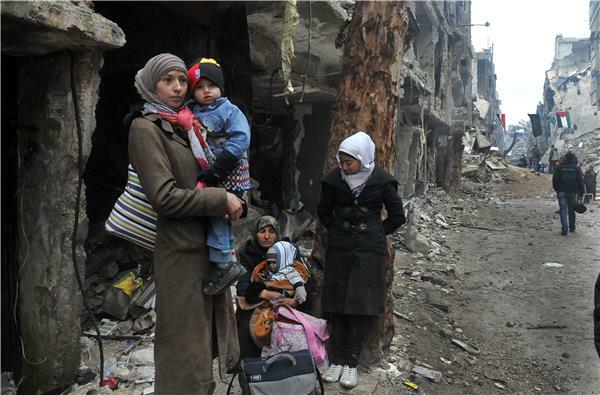 Al Jazeera English is now live with Nisreen El-Shamayleh to discuss Homs. -- On Saturday, aid is due to go in. -- The ceasefire will last three days. 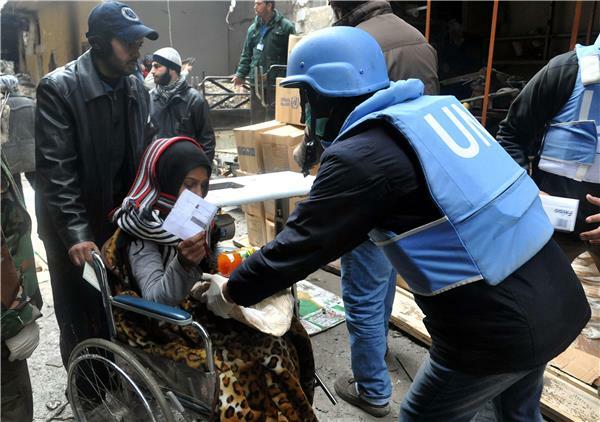 -- About 2,500 civilians are still in the besieged Old Homs districts of the city, along with about 700 armed rebels. -- Very little food supplies or fuel getting into the area.